Drug testing in hair is now routinely utilized in the Forensic and Family Law fields. The principles of drug incorporation into hair can allow a detailed history of drug abuse over time in an individual. The hair drug testing process used by AlphaBiolabs is considered the “gold standard” in toxicological analyses. Our drug tests are routinely performed using either scalp (head) or body hair samples and processed using up-to-date, streamlined techniques. The hair drug testing process is made up of five steps; sample collection, sample decontamination, drug extraction, simultaneous drug screening, identification and quantitation using High Performance Liquid Chromatography-Tandem Mass Spectrometry (HPLC/MS/MS) and reporting. Sample collection is a critical part of the process. Factors such as identification of the root end, sample weight, sample alignment, hair length and potential contamination must be considered when collecting the sample. If the quality of the collection is poor, it may limit the analyses possible, or in some cases require a sample recollection in order to perform the testing subsequently leading to delays in reporting. Most of the hair samples processed for drug testing are scalp hair samples, however it is also possible to test body hair samples including pubic and underarm hair (and if these are not available or insufficient we can also test samples such as chest, beard and leg although an approximate growth rate will not be applied to these samples). When a scalp hair sample is taken, a long thin strip of hair (equivalent to the thickness of a drinking straw/pencil) from the posterior vertex (crown) region of the head must be selected. People often believe only a few hairs will suffice however, it is essential to the analyses that the sample collected is of substantial weight. The sample MUST be cut as close as possible to the scalp. 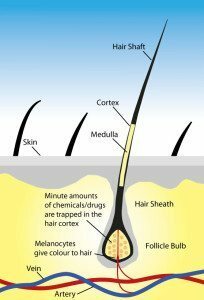 If the hair is extremely thin then it will be collected from several sites around the vertex region so that a large enough sample of hair is collected. The proximal (root) end of the cut hair is placed in the collection foil where marked and the foil will be folded securely around the sample to keep it together and aligned. The sample is then placed in a sample collection envelope with Sample Donor, Sample Collector and collection date/time details on. Finally, the envelope is sealed with a tamper evident seal and is ready for transportation to our laboratory. It is always preferable to collect a second or “B” sample at the same time. This sample can be kept securely in a separate tamper-evident sealed envelope at our laboratory. In this way, if the result of a drugs analysis is challenged, the untouched B sample is available for an independent laboratory to perform repeat testing if necessary. Dependent on the type of test required, samples can be taken by the sample donor for “Peace of Mind” testing or for legal drug testing an impartial third party must be responsible for taking the samples. For legal hair drug testing it is essential that the “Chain of Custody” is maintained. A successfully followed “Chain of Custody” protocol means that the sample can be proven to have come from the correct person by documenting the progress of the sample from the point of collection to the reporting of the result.In addition, the “Chain of Custody” will include steps to safeguard your specimen and to confirm the sample donor identity. A GP or nurse is the most common sample collector for a legal drug test. Peace of Mind hair drug tests can be performed on samples collected and provided by the sample donors themselves. However, because Peace of Mind tests are based on the information provided by the test participants, they cannot be used for any legal purposes such as Family Law Proceedings. Once the samples have been received, they are logged onto our case management system and given unique identification numbers. The next stage is to take digital photographs, measure and assess them, making contemporaneous notes with respect to hair length, colour etc. If a segmented analysis has been requested, the sample will then be precisely cut into the required lengths ready for analysis (segmentation is only possible with scalp hair samples). The hair is then put through a decontamination procedure; this is a series of chemical washes in order to remove as much as possible from the outer surface of the hair shafts prior to analyses. It has been reported in scientific literature that passive exposure to drugs such as cannabis and cocaine through smoke and/or direct contamination (i.e. the drug being in direct contact with the hair, e.g. by contaminated hands) may result in the presence of detectable levels, possibly even above the Society of Hair Testing (SoHT) cut-off values. This is why it is vital to perform this vigorous wash protocol before the testing begins. In cases where environmental exposure may have been an issue, the wash samples can be monitored and may allow the discrimination between direct drug use and environmental exposure. The washed hair samples are then pulverised and put through our laboratory procedure which will extract any drugs which may be present. When the extraction process is complete, the drugs are ready to be injected in to the High Performance Liquid Chromatography-Tandem Mass Spectrometer (HPLC/MS/MS). This instrument has the capability to perform the analysis in two stages. As the sample moves through the HPLC, any drugs that may be found within the hair sample are separated out so that they will exit at different times. As each drug leaves the HPLC separately, it enters the first of the three quadrupoles (MS) during which only a specific precursor ion (unique to that compound) will be allow to pass through to the next quadrupole while all others are filtered out. 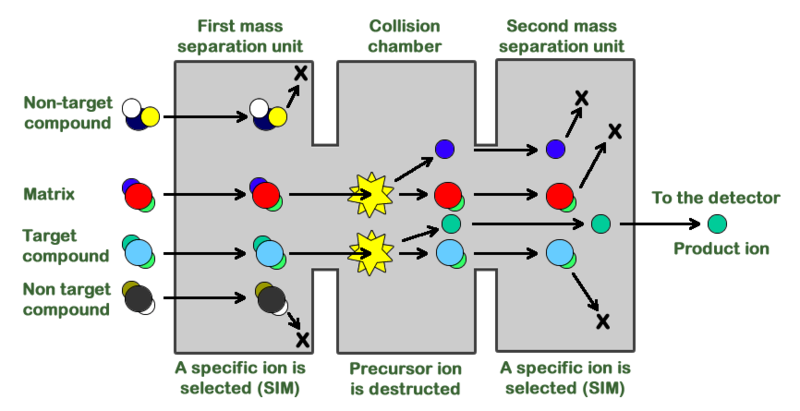 The second quadrupole will allow the collision of the specific precursor with a neutral gas, producing fragment ions(also referred as product ions). The generated fragment ions are then passed into the final quadrupole where a specific product ion is selected. This overall process is highly selective and removes possible interferences from other substances. It allows us to identify a drug present in the sample “beyond any reasonable doubt”. At the same time as the hair samples run on the HPLC/MS/MS, we will also run samples (called calibrators) with known amounts of each drug in. By doing this we can build a calibration curve that we will compare the amount of drug detected in the hair sample against and then quantify how much is present. Alongside this we also prepare Quality Control and independent Quality Assurance samples which must pass many safeguard checks prior to a test result being accepted and ready to report. Using this method in combination with the application of stringent quality assurance measures to ensure that the analysis and subsequently reported results are correct, allow us to have complete confidence in the findings. We provide a full range of legal drug testing services for you or your clients.